So a galette is really just a free-form pie with the edges folded partially over the pie filling. They’re casual enough to make for yourself for lunch, but impressive enough to make for company. 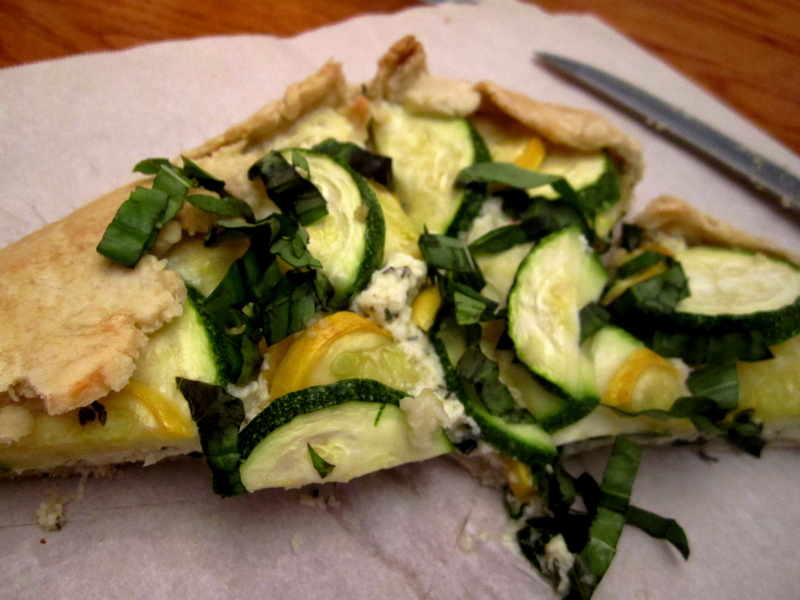 The crust on this is made lighter with olive oil instead of butter and is a light and flakey crust. I made this once for my friends, and then made it again a week later for SCL. It’s definitely a great recipe. Feel free to change up the filling with whatever seasonal veggies (or fruits!) you have on hand! For the crust, combine flour, salt, and baking powder in a food processor; pulse to combine. Combine olive oil with water and slowly add into the food processor until mixture becomes crumbly. Turn dough out onto a lightly floured surface and knead for 1 minute. Add additional flour if necessary to prevent dough from sticking. Gently press dough into a 5 inch disk and wrap in plastic wrap. Refrigerate for at least 30 minutes. Combine the sliced zucchini and squash in a bowl, drizzle with 1 Tbsp olive oil and the minced garlic, mix well. In a separate bowl, mix the ricotta, Parmesan, thyme, lemon zest and juice, pepper, and egg. In a small bowl, mix together the water and egg white. If needed allow the dough to warm up for 10 minutes before unwrapping and rolling out. When pliable, unwrap the dough and roll out on a lightly floured surface until you have a 14 inch circle. Place the dough on a baking sheet lined with parchment paper. Spread the ricotta mixture over the center of the dough leaving a 2 inch border. 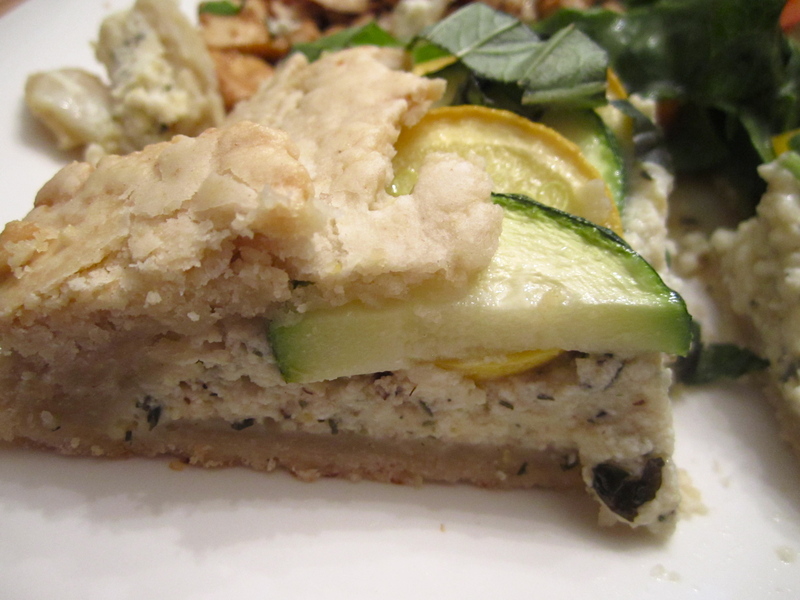 Arrange the zucchini and squash on the ricotta mixture. Sprinkle with kosher salt. Gently fold the pie’s border over the filling (it won’t cover very much of the filling). Gently brush the top of the dough with the water-egg white wash.
Bake for 40 minutes or until golden brown. Allow to cool for about 10 minutes. Sprinkle with basil. Yum! You’re making me hungry. 🙂 Thanks for sharing! Love your blog.